About a mile from Cautley in the Sedbergh direction there is a dog-leg bend in the road as it crosses a bridge over the River Rawthey. This is Straight Bridge, a rather incongruous name given the twist in the road! 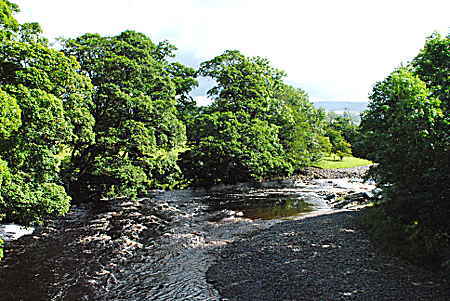 From there you can go over a style and walk alongside the river toward Sedbergh. 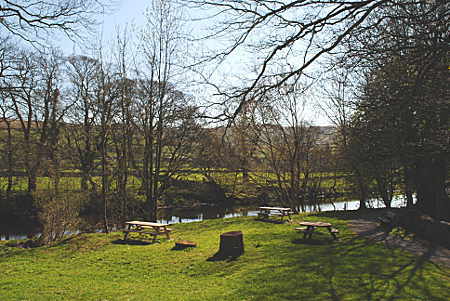 In this first photo, shaded by the trees in the centre of the picture, is the spot where Garsdale’s River Clough flows into the Rawthey. On the whole the path is easily walkable, although there are a couple of spots where someone less than steady on their feet might need a helping hand. It is almost exactly a mile to New Bridge. On reaching New Bridge, viewed above from the downstream side, there are several alternatives. 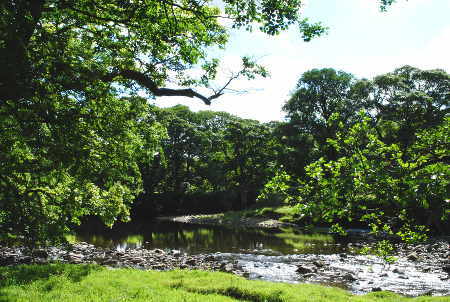 You’re only a few hundred yards from the centre of Sedbergh if you want to go into the town, or crossing the road you have the choice of two paths, one on each side of the river. New Bridge is, of course, no longer new. It is a Grade II listed structure, built to last in the 18th century. The photograph was taken in April following a dry spell but after heavy rain the combined waters of the Clough and the Rawthey, fed by numerous smaller becks, fully justify the scale and solidity of the structure. 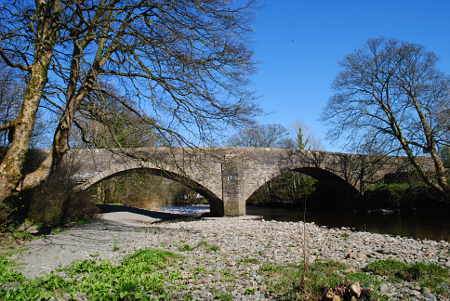 By New Bridge on the Sedbergh side of the river there is a picnic site, shown here before the leaves appeared on the trees. On a hot summer’s day you’d see less of the background but would find welcome shade from the heat of the sun. The path from here continues between the river and the grounds of Settlebeck School with views toward the town and the Howgills beyond. 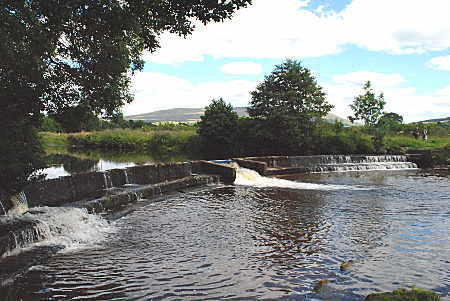 A little way along there is an interesting looking weir at which point the path on the northern bank turns away from the river in the direction of the town whereas that on the southern bank continues to follow the river to the next bridge, at Millthrop. From New Bridge to Millthrop Bridge is little more than half a mile, and there you reach the road to Dentdale . Here are two photographs taken by Millthrop Bridge, the first down at river level in April and the second from the bridge in August. 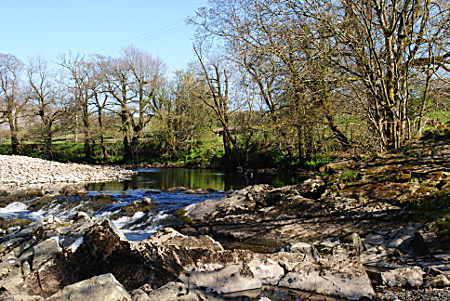 From here you can either head over the bridge and into the town or, just past the bridge on the left hand side of the road, join the Dales Way which after a short distance drops down again to the riverbank. 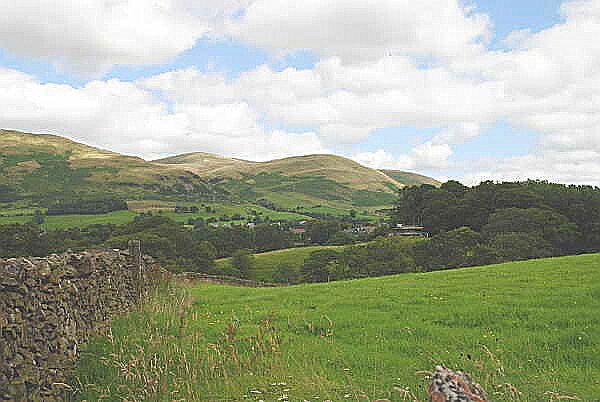 After a mile and a half you’ll reach the Sedbergh to Kirkby Lonsdale road; turn right to come back into the town. There are many other possible combinations and permutations of footpaths, roads and coutry lanes. Use a good map and invent your own routes. The suggestions on this site are meant simply as illustrative examples. 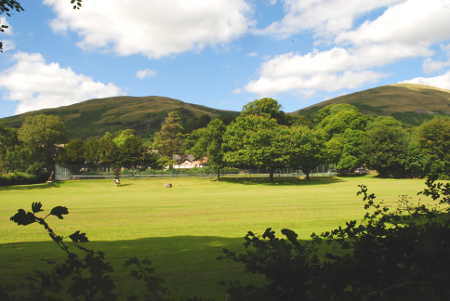 Enjoy the countryside around Cautley and Sedbergh, this lovely area of Cumbria in the Yorkshire Dales National Park.